The solution has freed up at least eight hours of labor each day. The Weidmüller Group is a leading provider of solutions for the transmission of power, signals and data in industrial environments with production facilities, sales companies and agencies in over 70 countries. Weidmüller in North America, based in Richmond, Virginia, USA, has over 750 distributors and direct customers and replaced an inflexible ebusiness solution for its JD Edwards World ERP with LANSA Commerce Edition to lift online orders from under thirty to over fifty percent. 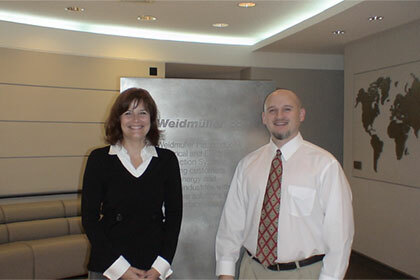 Selena Garner, customer service manager at Weidmüller, says, "Our company is expanding rapidly and sales have increased greatly over the last two years. Even so, the solution has freed up at least eight hours of labor each day. LANSA Commerce Edition is highly flexible and any requirement we dream up can be added. At first we tried to keep to the standard version, but once we realized how easy it was to make changes, there were no limitations." Weidmüller's customers in America and Canada consist of several hundred distributors, mainly electronics suppliers and OEM partners and a smaller number of direct customers in the railway, shipbuilding, equipment, process and machinery industries. Weidmüller had offered distributors online ordering and shipment tracking for a number of years, but the uptake was disappointing. "We want to receive at least 60 percent of distributor orders electronically, but we were achieving less than 30 percent," explains Garner. "The main reason for the poor uptake was that the site was cumbersome to navigate and lacked in functionality. Our distributors did not like the old website at all." Many distributors continued to place orders in the traditional way, by fax, phone and email which sometimes caused problems when distributors quoted incorrect prices on their purchase orders, or didn't realize an item was on backorder. Garner's team needed to contact the distributor to rectify the error, delaying delivery and straining the relationship, especially when a distributor had committed on a price and delivery date its customer. Weidmüller's call center also received many standard inquiry calls that could easily have been handled online. "The last thing you want is a customer service person on the phone reading off tracker numbers or stock levels," says Garner. "We needed a far more friendly and functionally rich B2B site." Weidmüller had given up trying to improve on the functionality of their existing packaged B2B website, as the vendor had become less responsive to their requirements. The architecture of the site was also a problem, as the solution required the installation of Java applets on a separate Windows server to access System i data. Implementing updates required two developers, one with strong HTML skills and one with JD Edwards System i skills. When the Java version of the applets started falling behind, hindering the upgrade to a newer Windows server, Weidmüller decided to look for a better solution urgently. "One of the reasons we chose LANSA was their good understanding of JD Edwards," states Kevin Rackley, systems analyst at Weidmüller. "LANSA Commerce Edition would also run on the same System i server as our ERP and was easy to customize and expand, putting us in control." We want to receive at least 60 percent of distributor orders electronically. With the assistance of a LANSA consultant, Rackley built and implemented Weidmüller's first B2B solution, a site for its American distributors, in less than two months. "From scratch to implementation took two months. In fact, getting the site up and running took one month," explains Rackley. "But once the site was available, everyone got really involved and changed their idea about how the site should look and behave. So we had another month of customization." "We first rolled out the site to the guys that complained the most about the old system," laughs Garner. "They told us about their favorite websites and their least favorite sites and what features work best for them." "For example, distributors often know the part numbers they want and don't want to browse the online catalog. Distributors can now key in all the items they need, even using partial item numbers and the system validates the entire order and shows the descriptions, prices and availability for all order lines simultaneously." Distributors and customers can also create custom catalogues of frequently ordered parts to get a quick overview of what is in stock and order without having to type any part numbers. They can also order by uploading an Excel file with part numbers and quantities to the B2B site. The online catalogue provides links to PDF files with datasheets and product specifications that are automatically downloaded from Weidmüller's mother company's website in Germany. Previously the distributor had to browse the German website for these sheets, not an easy task according to Garner. Rackley next implemented a site for distributors in Canada. The Canadian operation runs from the same server, but uses a separate instance of JD Edwards. "The Canadian site, even with many customizations, was operational less than three weeks after we demonstrated the US site to them," says Rackley. The third site was for direct customers. Although similar in functionality, over time this site has become quite distinct. For example, customer passwords can be automatically expired and the site provides a different view of the items, using different logical files behind the scenes. "By creating separate websites, each business division can make autonomous decisions, while we have the benefit of a single platform and single skill set company wide," says Rackley. From scratch to implementation took two months. "Less than two years after implementing the first B2B site, we are receiving nearly 50 percent of orders online and are well on the way to achieving our target of 60 percent. Just as importantly, the volume of inquiry calls has also dramatically dropped," says Garner. "The sites have helped bring in new customers. It's not only easier to deal with us than it was in the past, it is also easier to deal with us than it is to deal with our competitors." "We get compliments all the time. On the rare occasions that our ISP has problems, even if only briefly, we get phone calls immediately. That's a clear sign the site is constantly being used." "The site offers more features than we could ever offer before and saves time and effort on both sides. It is hard to measure, but I am sure average order cost and delivery time have come down," says Garner. "One feature that has greatly boosted the web uptake by distributors is drop shipping of goods directly to customers. Sales reps use a similar feature, so they can ship samples to their customers without any assistance from customer service." "We get a lot of small orders in the afternoon, just before the 3:30pm cutoff time for same day shipping. Previously my team had to scramble to key in those ‘red orders' on time and customers would call to confirm if they had made the deadline. Now it is so much easier. Orders flow straight to the warehouse and the customer gets immediate confirmation." "With LANSA we have a solution that is purely browser based and doesn't require a separate Windows server," says Rackley. "With everything on the same System i server it is a far easier to manage and more robust B2B environment than before. The System i never crashes, doesn't need rebooting and is very secure. Except for one planned upgrade, it has been up for two years." "We can offer our customers true 24*7 access. Customers access the site after hours, especially from the West Coast, and the warehouse always has new orders on Monday that arrived in the weekend." We are receiving nearly 50 percent of orders online and are well on the way to achieving our target of 60 percent. "LANSA Commerce Edition is highly flexible. Any requirement we dream up, can be added to the site," concludes Garner. "At the beginning we tried to keep to the standard version, but once we realized how easy it was to make changes, there were no limitations. The more we asked for, the faster the changes came. It was just amazing. It was something we had to get our mind around, because the old system was so inflexible and nothing could be changed," says Garner. "With LANSA we can maintain and customize the web solution with our own System i developers, who also understand and maintain our JD Edwards ERP," adds Rackley. "The LANSA Repository and 4GL are easy to learn. In the old days we always needed help of the vendor and two people to upgrade the system, one with PC skills and one with System i skills." "Now one person with only general HTML knowledge can update the system and that is where we will continue to save money." "Back in 2005, we needed something we could implement quickly and painlessly, and that's what we got with LANSA Commerce Edition." "But we are barely tapping on what LANSA can do and we are getting excited about what other solutions we can deliver with LANSA," concludes Rackley. LANSA Commerce Edition is highly flexible. Any requirement we dream up, can be added to the site. Weidmüller is the leading provider of solutions for the transmission of power, signals and data in industrial environments. The company develops, produces and sells electromechanical connection technology, switching cabinet electronics and network infrastructure components. The Weidmüller Group has a strong international focus with its own manufacturing plants, sales companies and agencies in over 70 countries. In 2006, Weidmüller generated sales of € 443 million and currently employs some 3,000 people worldwide. Weidmüller in America is based in Richmond, Virginia, while the Canadian operation is based in Markham, Ontario. Both operations run separate instances of JD Edwards World 7.3 ERP on the same IBM System i model 520.